If you are cooking a whole chicken, especially for Sunday lunch, one favourite way is a simple Roast Chicken recipe. 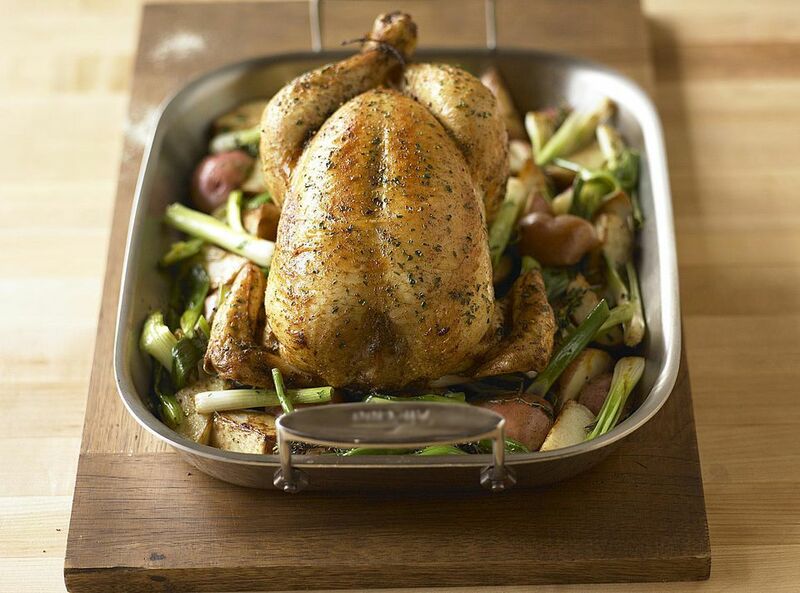 A great roast chicken does not to be saved just for the Sunday dinner; it is delicious any day of the week. In this traditional recipe, the chicken is cooked in lots of butter so the chicken remains moist and succulent and the skin crispy and golden. When choosing a chicken to cook, a higher welfare bird is always preferable. It is always comforting to know the bird had led a happier life plus the meat is, by far, tastier. A classic roast chicken is simple to make and aside as a roast on a Sunday and served with Yorkshire Puddings, the chicken is super served cold for lunch, in sandwiches or for a picnic. Place the chicken, breast up, in a deep roasting tin. Massage the softened butter all over the chicken breasts, legs and sides. Toss the remaining garlic into the roasting tin and place into the preheated oven and cook for 1 hr 30 minutes. Remove the chicken from the tin and wrap tightly in aluminium foil and leave the bird to rest for 15 minutes. Put the roasting tin over a medium heat on the stove top and bring the chicken juices up to a gentle simmer. Slowly raise the heat to high and add the white wine. Stir the wine and juices thoroughly with a wooden spoon and simmer for 5 minutes. Add the chicken or vegetable stock, stir again, lower the heat and simmer until reduced by one-third. Unwrap the chicken and add any juices released by the chicken into the sauce and bring back to the boil. Remove the sauce from the heat and strain through a fine sieve into a warmed gravy boat or jug. Put the chicken onto a carving platter, surround with roasted vegetables. Serve the chicken immediately with the sauce on the side. To ring the changes on this simple (and delicious) roast chicken, try an alternative a lemon roast chicken and don't forget to save the chicken carcass to make a chicken stock, or a soup. For more advice on roasting a chicken take a look at these 7 Tips for Cooking the Perfect Roast Chicken to ensure yours is always at its best.